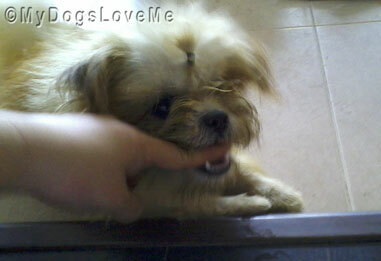 My Dogs Love Me: Mischief Monday: Evuhl Evuhl Human! Mischief Monday: Evuhl Evuhl Human! My sister decided to comb Chooey's beardie. And no, that wasn't enough for her! I SAID, WHAT THE HELL, HUMAN?!? 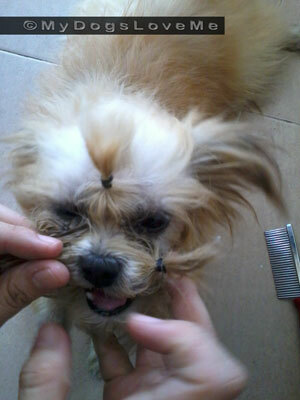 Poor Chooey's getting her beardie pony-tailed. Injustice! My life in this beautiful home is HORRIBLE. Help me, anyone! My sister thought she looked cute with ponytails on her beardie. Poor Chooey doesn't look happy at all -_-. Now, we're even! Justice has prevailed. Hee hee, gotta get even. Looks cute though. Yep we agree got even there. Have a lovely Monday. 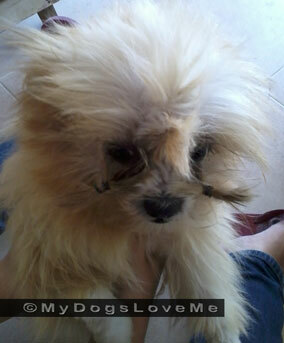 It looks like a cute little mustache!! I know all about pony tails too buddy!! You have my sympathy!! :) Though you did look kinda cute, just saying! BOL! You showed her, Chooey! Poor Chooey! We suffer such indignities at the hands of our humans...all just to please them. Glad you let her know enough was enough! Oso means bear in our SW part of the US as well and he is our littlest member of the WDA so hearing him roar was quite exciting! Michael is our human cousin (momma's nephew). He is a special needs young man with autism who came to live with us (he calls himself a rescue, too) two years ago.He is currently doing very well in a community integration program in high school and was coming home from volunteering at the museum when we sang the song we posted about. That's good to hear. To live a purposeful life is just awesome. I am glad Michael has found his calling. Oso, the little bear in white fur! That was a TOTALLY JUSTIFIED bite! Humans....what can you do! We feel for you. Haha, that'll teach her, BOL! All you need is to add a few beads for Jamaican style! That would drive us crazy! Oh my, Chooey does not look happy. We hope that style is just for Howl-O-Ween. Your right...us humans can be pretty silly...its only cause we LOVE you! How DARE the human subject you to that craziness, Chooey. Way to put the bitey on to show who's boss! LOL! BOL!!! Oh Chooey, I guess it serves her right for giving your beard pony tails.